It’s that time of year again when our six weeks of winter breaks into spring where we’ve waited nine months for this glorious 80 degree weather. It’s also the time when auto makers enjoy bringing their latest products to Phoenix for us to glamor and adore over while enjoying a good game of Spring Training Baseball. 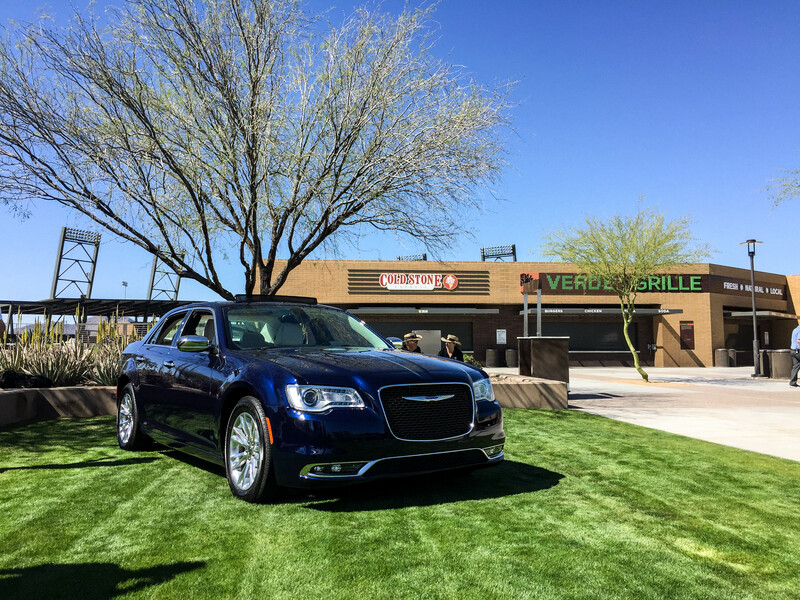 This week, Scott Brown, Jiyan Cadiz, and John Zaremba with Chrysler flew over and introduced us to the restyled 2015 Chrysler 300. Introduced for 2015, there are subtle changes to the Chrysler 300 that may seem insignificant; however, it goes a little deeper than one realizes. Chrysler quoted that they wanted to bring back some of that bold American car they had when the first launched the 300 back in 2004. By making the grille taller and wider, adding LED fog lamps with a lower facial chrome trim, new styled wheels, and a fantastic looking set of taillights, we believe they achieved what they were attempting to accomplish. Swaying away from the SRT Performance grade by leaving it to Dodge, the 300 will be offered in either a 3.6-liter Pentastar V6 or the confident holding 5.7-liter HEMI V8. The 3.6-liter is quoted to hold 292 horsepower and 260lb-ft of torque which is delivered to the rear wheels through an 8-speed automatic and to 60 mph in about 6.5 seconds – an optional All-Wheel Drive is available for those who have to shovel through snow, but thats only the V6 version. Opting for the 5.7-liter HEMI is rear-wheel drive all the way delivering 363 horsepower, 394lb-ft of torque and from zero to 60 in 5 seconds. Four trim levels are available on the 300 starting with the Limited at a reasonably priced $31,395 which offers standard leather interior, then you have the 300S, the 300C and the big daddy 300C Platinum which incorporates a Napa leather interior and Italian stimulated leather trim on the dash and door panels. Some interior refinement was added to this 2015 300 giving more of a luxury approach to take on some German competition, the ever thorn-in-the-side Ford Taurus and better yet that sneaky Hyundai Genesis. Better quality materials have been added for that luxury enhancement, a new instrument cluster with a 7” digital display, new steering wheel mounted controls and a new rotary shifter. You can also expect all the latest advance safety features such as Blind Spot Monitoring, Adaptive Cruise Control, Automatic High Beam Control, Forward Collision Warning, Lane Departure Warning and Rain Sensing Wipers – of course those will be optional extras. We have always been big fans of the 300 since its debut in 2004, this new 2015 expresses a new sharp aggressive sensation that you just don’t get from large sedans like the Toyota Avalon and Hyundai Azera. Hopefully we’ll be able to bring you a full report once we get behind the wheel and rule the rough side of suburbia. What’s not to love about a big burly blue American sedan? I’ll take it. Absolutely! And its so dreamy to drive.